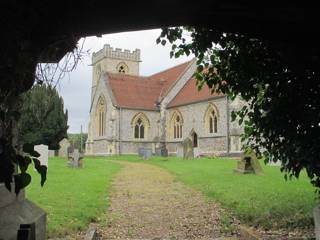 To find this church take the A1066 from Thetford towards Diss. After about three miles turn left (north) towards Shadwell. After a few hundred yards you will cross the Little Ouse river and the church is on your left. There is some doubt as to the name of this church. You may find it referred to as St Mary's in some sources. For more details of this church visit Simon Knott's excellent website at www.norfolkchurches.co.uk (he has it as St Mary). Also, be aware that there is a church (St Mary) at another village called Brettenham which is in Suffolk. The GPR holds 72 grave and 113 person records for the burial ground.